Shelby Gonzalez to Represent Polk County in Miss Texas Pageant, LIVINGSTON, April 13, 2010 - Shelby Gonzalez, 18, of Livingston will be the first ever Polk County representative to compete for the title of Miss Texas on July 2, 2010. Gonzalez recently traveled to Arlington, Texas where she was crowned by Miss Texas, Kristen Blair in a ceremony that officially enters Gonzalez into the Miss Texas Pageant as a representative of Polk County. 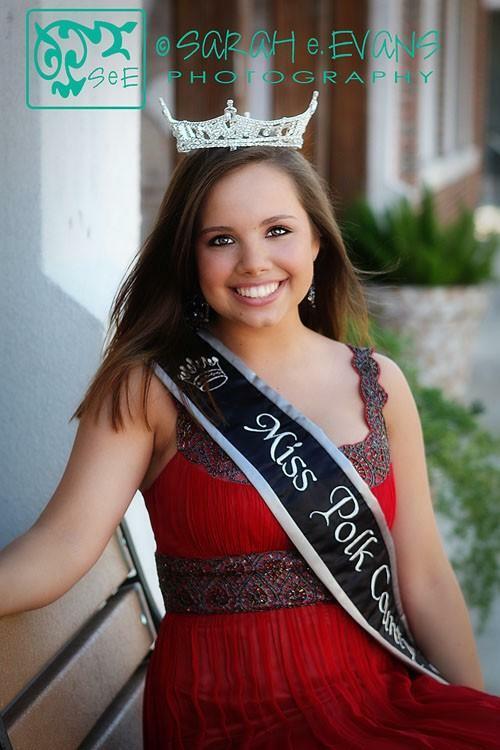 Gonzalez is the reigning Miss Texas Farm Bureau and was also crowned Miss Polk County in 2009. The winner of the Miss Texas Pageant will move on to compete for the Title of Miss America. Shelby enjoys singing, traveling, working out, shopping and spending time with family. The most valuable lesson I have learned is that shyness will only hinder accomplishing your dream. My first vocal teacher told me this at our first lesson. I used to be very apprehensive when something was new to me, and it would take awhile to warm up to the situations. He expressed to be the importance of putting my personality out there for the world to see, to take chances in life, and never let my feels of insecurity hold me back because there are millions of people out there ready to grab the bull by the horns! What makes me special and unique is my determination and maturity at such a young age. I am eighteen, but I assure you each one of those years has come with many accomplishments. I know what I want out of life, and I�m giving it my all to accomplish that. I have grown up in a single parent home, which at times has forced me to grow up, and take responsibility for helping my family. This has not hindered me, but only made me stronger with real life experience. My favorite sport is baseball, and my secret wish is to one day dress in uniform and play with my favorite Texan team the Houston Astros, for at least one inning. I say one inning because I try to live in reality, and I�m sure they would not want me to play a whole game with them. Currently attending Sam Houston State University in Huntsville, TX, majoring in Interdisciplinary Studies, planning to be an elementary education teacher. I would appreciate any support that could be provided as I represent Polk County for the first time in The Miss Texas Pageant.